Omega Constellation Collectors: What Makes an Omega Chronometer Special? What Makes an Omega Chronometer Special? Omega Constellation and other model chronometers from the 1950s and 60s are regarded as more collectible and valuable than their unadjusted contemporaries. But should this be so? Does a chronometer retain its 'chronometer-ness' over the years, or does time and wear render it no different to non-chronometer models? Click here for an essay on what goes in to a chronometer before the case back goes on. The file is large so it will take a little time to download. That is why we love them. Dear Collectibles Author - This is NOT spam; I promise. If you have any questions, please contact us at either Email address. Thank you. My name Ildar... i from Russia Moscow. i searching this sphere watсh on the street shop. Yes indeed Ildar....the piece is a fake. And such model was at Omega? 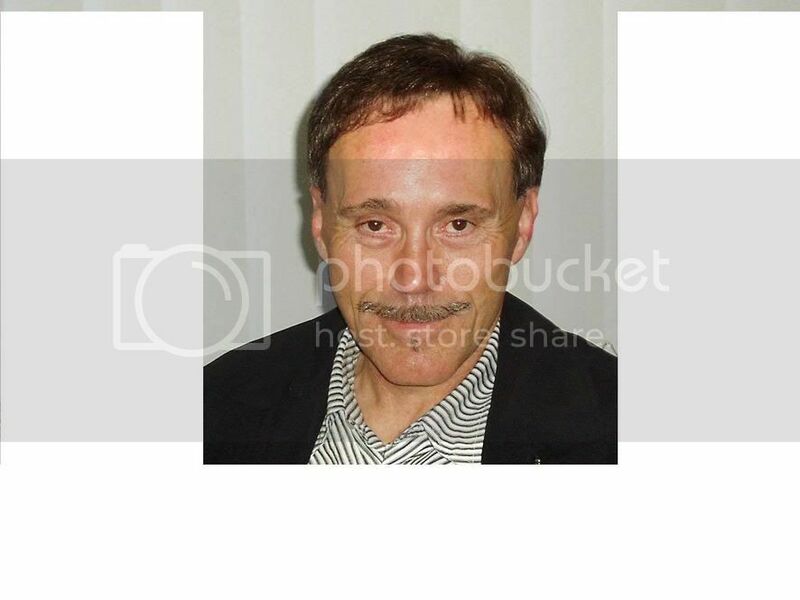 You do not have photos..? What I am saying Ildar is that the watch IS fake. OMega never made such a watch. I've recently acquired a constellation mod 168018 with a 564 movement. The dial hour markers have black paint in the groove, while I understand this model had onyx inserts. The guy who sold this to me swears his father bought this watch new in Switzerland decades back. Given the paint on the markers, could this be a fake ? Thanks.. Sounds dicey. Best let me see a picture, as these 018s tended to have thick markers with quite large onyx inserts. Click on 'About Me' and you'll see a click through to my email. Hi, I'm Francis from the Philippines. My grandfather left me an exact same watch as shown on your page and I was wondering as to its value. Likewise, would there still be replacement bracelets and glass coverings as they are really needing to be changes. I just noticed "Chronometer" sign on my watch and was wondering if it still is after this many years and could watchmaker ruin it's adjustments while cleaning/servicing? The issue would be that the chronometer status of the watch would be compromised if it wasnt serviced regularly. After cleaning and oiling, a watchnaker then will regulate the watch to the finest tolerances possible. Servicing intervals are usually between three and five years. I have read about the famous 100,000 certified chronometer movements Cal.561 (27,90 RA) numbered 24,410,000 - 24,509,999 that were tested (or manufactured?) between 5th October 1964 and 10th February 1966. Is this true of the 561 and do they command a higher price when found in a Constellation watch? It's all about the novelty factor of owning one methinks. I have recently aquired an Omega Seamaster with an 564 certified chronometer movement. The case reference numbers are 168.022/166.028. How would I go about obtaining the certification for this particular movement (I have the serial number recorded) from Omega? I think the best option would be to contact OMega at http://www.omegawatches.com/customer-service/contact-us and ask them what you need to do to obtain an "extract from the archives" . Omega will need serial and case number, and in the past they used to ask for pics as well. Have had the cal 551 gold-cap Constellation from ebay for a little over two days now, and I'm a little worried about the watch because, although everything appears authentic, the watch doesn't seem to wind automatically. As opposed to my Geneve, where the second hand will start moving as soon as I pick up the watch and put it on, the Constellation will not run once it has run out of power unless I wind it. Even if I move the watch around a lot, turning it over and around over and over again, it doesn't begin to run. If I pull the crown out, set the time, and then push the crown back in place, the second hand moves for a minute or so and then stops. If I wind it, the watch runs fine until it loses power. Does this sound like a major problem, or is this common? I'm waiting to hear from a local watchmaker about setting up an appointment. He's on vacation and should be back this week. But I'm feeling like I want to figure out what's wrong in a hurry so that, if it's something major, I'll still have time to return the watch to the ebay seller and get my money back. I'd really like to keep the watch though. I'm already very fond of it. Any idea what could be causing the watch to do this? Is this unusual for vintage Constellations? Sounds to me it couold be the reverser wheels are stuck or the rotor isnt functioning properly. I cant recall the service history on this one, but if you dont know when it was last serviced, its best to have it checked. Sometimes watches get thrown about in the mail and so its always an idea to have them checked anyway. There is some good news and possibly some bad news about this watch. This post will be somewhat long. Hope that's okay. If not, please let me know, and I can email this to you (ct11127@ yahoo.com). I'll begin with the good news: I took the watch to a watchmaker, and he looked at it briefly without charging me. He said everything in the movement looked fine: the crown sealing and the case back gasket looked fine, and it appeared to have been correctly oiled. I looked at the movement, and verified that the serial number was indeed the one given to me by the seller and that the constituent parts of the movement were uniform in color, hue, sheen, etc. I also noticed a number 1 engraved inside the Omega symbol, which, according to your essay, is correct for a pie pan. So apparently some movements sat around for a bit before being matched to specific cases (but I could be wrong). Now the bad news: The reason the watch seems to be reluctant to run even when wiggled about is that the second hand and minute hand appear to be making contact. Whenever the watch stops, the second and minute hand are always aligned. Indeed, today I observed the second hand stopping as soon as it reached the minute hand. I contacted another watchmaker about this, and he said that this could be the case--or that there could be a problem with what he called the "gear train." If I wind the watch and wear it all day while active, it runs fine for quite some time, but as the power reserve gets depleted once I've taken it off, it seems to stop after an hour or so in the manner I've described--with the minutes and seconds hands overlapping or aligned. And so I'm wondering if I should just return the watch or whether I should have it repaired. The seller has a watchmaker here in the US and has offered to repair the watch free of charge (although I haven't yet given him all the details). But things like problems with the drive train seem a little cringe-worthy and make me a bit reluctant to keep the watch. Also, I have no idea how competent his watchmaker is. Sorry for such a long post. Just trying to be as comprehensive and precise as possible. It sounds to me that 'almost' everything is right with this watch, and your explanation about the movement staying in inventory until ready to b e case is correct. Re the hands. This could be a very minor thing that occurred when the watch was last serviced. The hands are the last parts to be fitted before that watch returns to the case and the sweep could have been ever-so-slightly bent. If you are otherwise happy with the piece, then I would be inclined to call the watchmaker who looked at your watch and ask him what would he charge to eliminate the hands sticking. Welcome to the world of mechanical watches. Funny thing but the chronostop I had recently serviced did exactly the same as your watch. I would be inclined to ask the seller to pay for the cost of the hands being fixed at a watchmaker in your locale rather than have it travel again. Good luck with that Chris.....as it does seem to be a minor issue, and if that is the only one, it could be a simple matter. 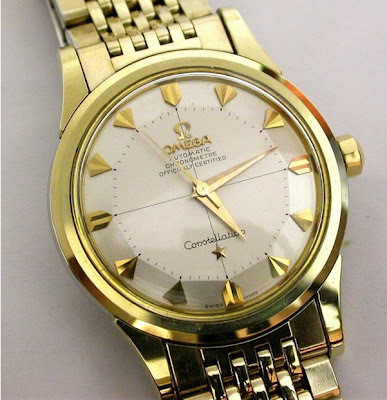 Could anybody tell me anything about a omega chronometer automatic co-axial escapement limited edition? That is what is read on the face of the watch. Then on the back you can see the mechanism of the watch. I don't know of any Omega that would have Limited Edition on the dial. It sounds like a fake to me. You're right, this model isn't in the Omega database, but that is no biggie. You have what is known as a Pre-Manhattan. Manhattans were powered by 14xx calibres and cal 1333 was produced in 1980 for Constellation quartz chronometers. Pre-Manhattans show the evolution of the case and pinned bracelet, when the case body has taken on a particular shape, but not yet the full cushion shape of the Manhattan. The machined bezel was quite attractive. They're not particularly rare, but are interesting because of the above. What is the difference between A chronometer watch and chronometre ( apart from spelling) and is there a difference in value please ? Chronometre is the French spelling, and I often interchange the term as a mark of respect for the traditions of the industry in mainly the French-speaking part of Switzerland. 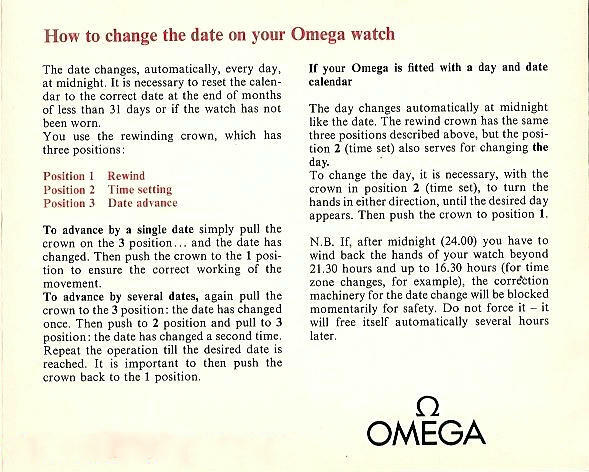 So, in the Omega case the word 'chronometer' began to appear from around 1958/59 and was a simple change from the French to the English, probably in reaction to French becoming a lesser global language and no longer the diplomatic language of the world. In terms of price, highly accurate chronometres like ships chronometers, for example Omega's Chronometre de Bord from the earlier part of the Twentieth century, can fetch quite high prices. Generally chronometers/chronometres realise higher prices than non certified chronometers.